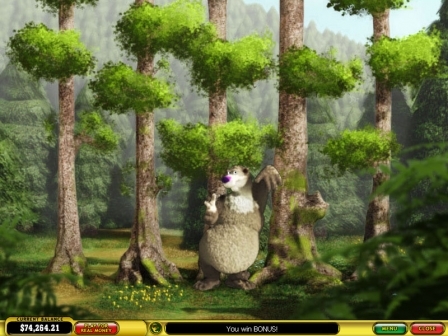 Rain or shine, wet or fine... Make your way through the depths of the Magical Wood playing Bonus Bears slot. By the way, take the HUGE basket with you. So that to pick ALL of the delicious money prizes that can appear at every step. So, the incredible forest treasures are waiting for you! Just feel the stupefying odour of the forthcoming winnings walking among the lavish bushes and affluent trees! Get ready to have the thrilling adventure on all 25 paylines of the video game. Any time, spinning 5 reels, you can meet with Master of the Wood. 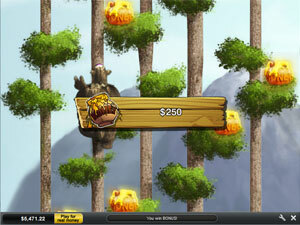 Powerful but kind, Bear will show you the dainty places of his Kingdom created by Playtech. 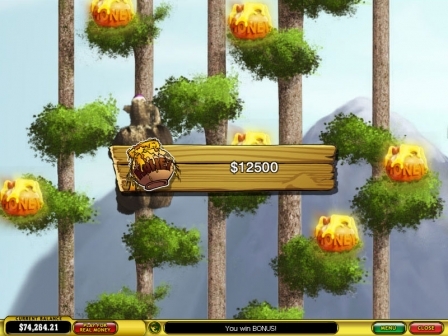 Can you win his favour and become the Forest Millionaire today? Mr. Bear is in charge of all the money matters in the mysterious woods. So, choosing any coin sizes such as $0.01, $0.05, $0.10, $0.25, $0.50, $1, $2 or $5, you should report to the Chief on it. HE should also know how many coins you put per each line accepting from 1 to 10 coins. Every stake, every spin make you closer to the desired winnings. So, the more you bet, the faster you reach the top of the tree where the top jackpots are hidden. But Rangers watch your gambling carefully! That's why, try to lull the vigilance of 5 Rangers spinning the reels with the maximum stake of $1,250 and... The most mouth-watering jackpot of 5,000 coins or $250,000 is YOURS! However, you are also able to play with the smallest bet of $0.25. So that to explore the gambling ground and prepare for the finger-licking wins. Looking forward to you at Bonus Bears slots machine. All the foresters are in a flap! What's going on? Maybe the Bear is coming out of the forest thicket? To bring you his tasty money presents. As He is not only the Wood Boss, but the Wild symbol as well. Appearing on the 2nd, 3rd and 4th reels and replacing other slots icons with joy. Willing to have a look at the happy dancing Bear? 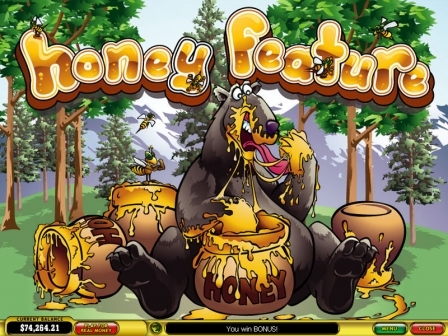 Then, use its symbol in the winning combination or... Set the honey trap to catch 3 Bears on the reels 4, 3 or 2 and win 15 Free Spins. Our Bear is an excellent apiarist keeping lots of Beehives in his own bee-garden. But you should take pains so that to find at least 3 Beehives and trigger the Honey Feature. Each Beehive image is the scatter symbol. That's why, the more Hives you run across while gambling, the more sweet cash you gain. What if 5 Scatters fly onto the reels? Hm... Then, wait for the swarm of the buzzing guests bringing you the special prize of $125,000! It's the real jam, isn't it? Just one neat spin with the maximum stake can be enough! 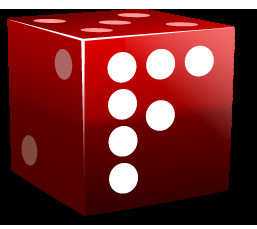 Start Free Spins Feature increasing all your wins by 3 times! Succeeded in taking Bears' fancy? Yahoo! 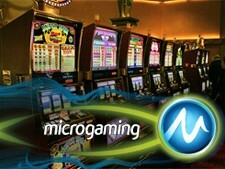 Win more cash with retriggered Free Spins then! What about climbing trees and looking for the luscious money gifts? Afraid of heights? Never mind! Our clumsy Bear will rush to be helpful for you after you catch 3 or more Beehives on the lawn and activate the Honey Feature! Just point to a tall tree out of 5 to climb and... Bear will start clambering up and gathering the honey pots on his way! Watch out! 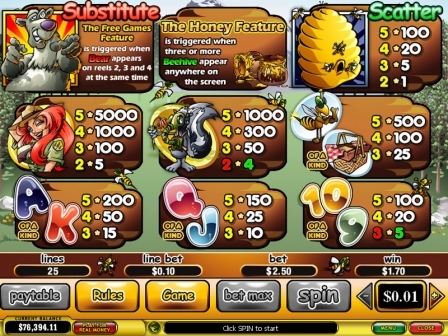 When the Beehive is noticed, you are awarded with the sweet prize doubling your total bet and the bonus game is over. So, follow your intuition when choosing the most profitable tree. The more honey, the more money! That is your motto in Bonus Bears video slots. 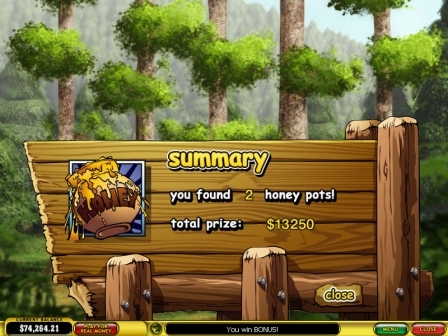 So, do your best to trigger the Honey Feature even during Free Spins! Still thinking how to spend your weekend? We offer you the IDEAL way. To enjoy yourself and win a lot of savoury cash presents growing everywhere! 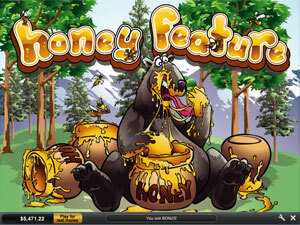 Just launch the fantastic Bonus Bears slot machine to play it online and... Get the gulp of fresh air with every spin you make.